Over a 4-month period from December to March, these five schools, as part of Solar One’s Green Design Lab program, combined saved 246,020 kilowatt-hours of electricity – enough to power 23 homes for one year*. As a result of their efforts, they avoided 374,000 pounds of carbon dioxide from entering the atmosphere**, the equivalent of burning 182,000 lbs of coal. As a prize for their success, each school will be awarded with $5,000. 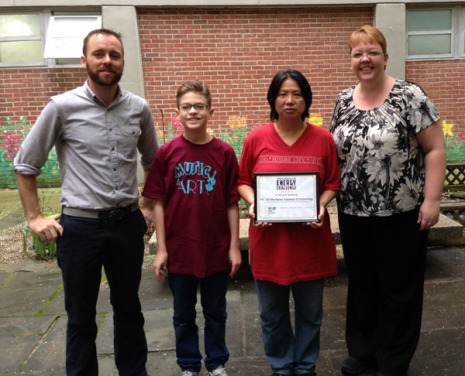 PS 126 Academy of Technology in Manhattan came in first place with a whopping 33% reduction, and on Friday, May 9, Solar One presented them with their award. 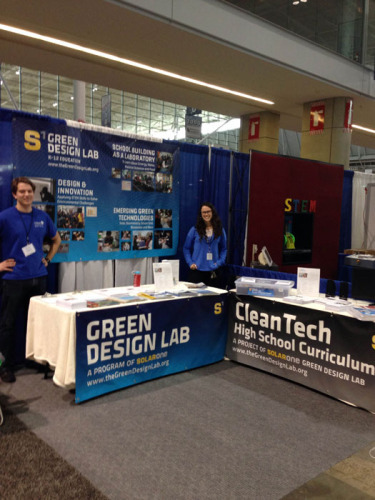 Last week at the National Science Teachers Association (NSTA) annual conference In Boston, Solar One introduced the Green Design Lab National Network. Through curriculum, technical support, online webinars and more the National Network will expand the reach of the Green Design Lab (GDL) program to schools beyond New York City public schools. Hundreds of science teachers from across the country were introduced to the program and intrigued by the potential to incorporate hands on sustainability projects into their science units. This week, Solar One Educators delivered professional development training sessions to 65 NYC teachers from schools across the 5 boroughs. Elementary and Middle school teachers were trained in Green Design Lab curriculum and high school teachers were trained in Solar One’s advanced Clean Tech curriculum. 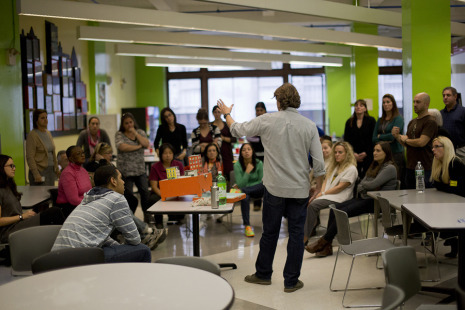 The Solar One Education team modeled hands on activities from the curriculum with the teachers, and discussed the importance of urban environmental education for students in NYC. On Saturday September 28th, Solar One Educators joined a group of speakers to discuss kick-starting sustainability efforts at one of our partner schools, PS 33 Chelsea Prep. Solar One Educators focused on informing families about the Green Design Lab energy challenge, and the students were able to show off their human powered bike blender that Solar One helped to fund through a partnership with IOBY last school year. 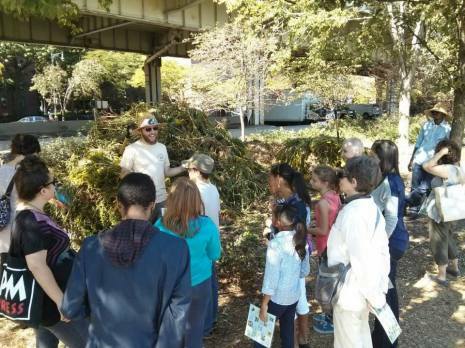 The event was part of the USGBC Green Apple Day of Service, which is an annual event where communities around the world work on projects to help make schools more sustainable. Solar One was awarded an Innovation Generation Grant in the amount of $25,000 from the Motorola Solutions Foundation to support its CleanTech program. “We’re delighted Motorola Solutions chose to support our CleanTech program, which engages high school students in a way that ignites their passion and interest in science, technology, engineering and math (STEM) subjects and careers,” said Chris Collins, Executive Director of Solar One. 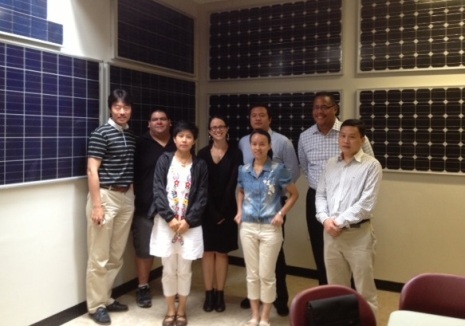 On Monday morning, a delegation of seven officials from China toured the Solar One Workforce Training Center and held a meeting afterwards to learn about how Solar One develops and manages its educational programs. The officials, from both government and NGO organizations in China, were extra excited to see the training center, where Solar One holds it’s workforce development classes. The exchange was mediated by professional translators, who utilized a live-translation earpiece system, whereby each person wore an earpiece and could hear the translations on-the-fly.